Rachid El Khalifi has signed a 1.5 year contract for MLS-club Real Salt Lake City in July 2009. He came from Cambuur Leeuwarden on a free transfer. 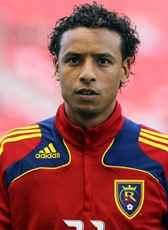 On March 2 2010, Real Salt Lake announced that the defending MLS Cup Champion has waived Rachid El Khalifi. El Khalifi departs Real Salt Lake after just half a year with the Utah side, the Dutch winger making four appearances (three starts) last summer in League play totaling 178 minutes of action. In July 2010 he is playing several trials to find his luck at a new club. Finally he moved to the amateurs of SC Feijenoord and retired from professional football.